Isaac Levitan, despite the hard fate, wrote a lot and left a legacy of many landscapes of magnificent beauty. All his works are expressive, from them breathes love for the motherland. The simple plot of the landscape speaks of Levitan’s respect for the nature of his native land. In the painting “At the shore. 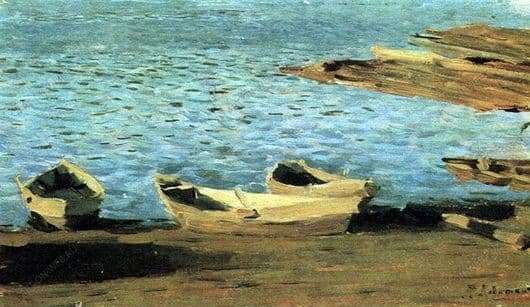 Boats “Levitan depicted a quiet summer day. The sky is not visible on the canvas, but it is clear that the sun is high, it is reflected in a medium-sized ripple of waves. In the foreground are three wooden boats standing on a sandy beach. On the side of them are seen large wooden walkways. The remaining space of the picture is water. It seems that it is infinite. When looking at the picture I want to think about life, its quiet rhythm. The water is simple, like nature itself, there is no evil, flattery and lies surrounding the artist in life. The river is quiet on this day, only small ripples break its solemn calmness. On the canvas the artist did not depict a single person, emphasizing the silence and serenity of the moment. Levitan is a true master of landscape, his paintings are as if alive. He shows nature in its smallest details, in all its versatility. The blue water, which occupies most of the composition, is beautiful. Small waves, sparkling in the sun, and beckon to plunge into it or ride on a boat empty on the shore. The absence of the sky pictured in the picture gives a feeling of the infinite expanse of water. Levitan uses the landscape “On the shore. Boats “warm shades of color, without bright spots. This technique makes the work calm, warm and soulful. Yellow-brown sand seems warm, warming the body and soul, because it is the native Russian land. Product Levitan wanted to make the viewer think about the eternal, the meaning of life and being. The water in the picture makes the viewer think that life is fleeting, but nature is eternal.